Between Xmas and New Year, I had a craving for a good plate of savoury food for a change, whereas the mister fancied a sweet tier of Afternoon Tea… It was a complete role reversal, oddly. After a bit of searching (good old Google!) I realised that we hadn’t yet been to Quy Mill, which was a shame as it wasn’t too far down the road from home. What had really struck out on their website was that they served a “Gentleman’s Tea”, complete with Suffolk rusks & warm bread, local cheese, a hand raised pork pie, home made piccalilli, picked shallots & chutneys and ½ pint Adnams bitter. It sounded like a winner to me, the table was booked for 3.30pm and we were headed down the A14 a few hours later. Recently awarded with two AA rosettes, Quy Mill is surprisingly peaceful set beside the A14 near to Burwell and Lode on the outskirts of Cambridge. I’ve passed it hundreds of times quite literally and I’ve never thought to stop there for a bite to eat, their menu appeals for a nice and peaceful evening meal one day. It was quiet when we arrived, being shown to the Celtic Lounge and being allowed to choose where we sat, we could see that we had missed the Sunday Lunch rush and that suited us perfectly. We picked a really cute booth, complete with a large enough table for two tiers and the comfiest booth seats I’ve sat in, it was just perfect for a snoozy Sunday Afternoon treat. 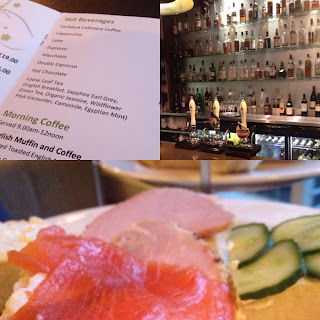 Unfortunately, the menu had no sign of the gentleman’s tea which I was truly annoyed at, as I had psyched myself up for the menu and was genuinely excited about trying it in the few hours prior to our visit, so this was a disappointing error. The lovely waitress apologised (seeming a little embarrassed almost, bless her) that this was still showing online and mentioned that she would make it aware that this needed to be removed. I actually think it’s a shame they don’t offer this, as it was the attraction/pulling point for choosing them on this occasion, I’m sure we wouldn’t be the last either. Offering views out onto the perfectly preened lawns, guests can enjoy the dining room’s toasty log fires during winter, and dine out on the Al fresco terrace in warmer weather. 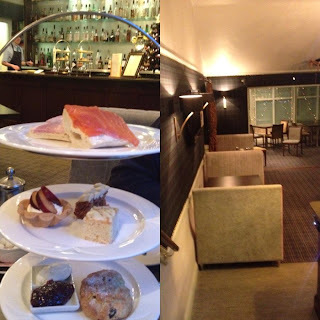 Today it was fairly chilly so we kept wrapped up in the warm, loving the padded tartan walls surrounding us in this room, it’s great fun, especially decorated with Christmas lights, it was a lovely place to be post-Xmas for a treat or three. We both went for the afternoon tea tier minus the champagne on this one, after already having a few tipples over the past week or so. The mister went for a pot of Fontaleza coffee and I chose their Sapphire Earl Grey which was loose leaf and in a generous sized teapot that I couldn’t finish over the afternoon – a nice element to a tier when you don’t have a teeny pot that needs refilling! The only thing I would suggest is that they provide a small dish for you to take the tea infuser out onto, as the tea went bitter half way through drinking it, which is a tiny shame. Bottisham smoked salmon & horseradish cream, egg mayonnaise & English watercress, home baked ham & English mustard and cucumber & chive cream cheese. 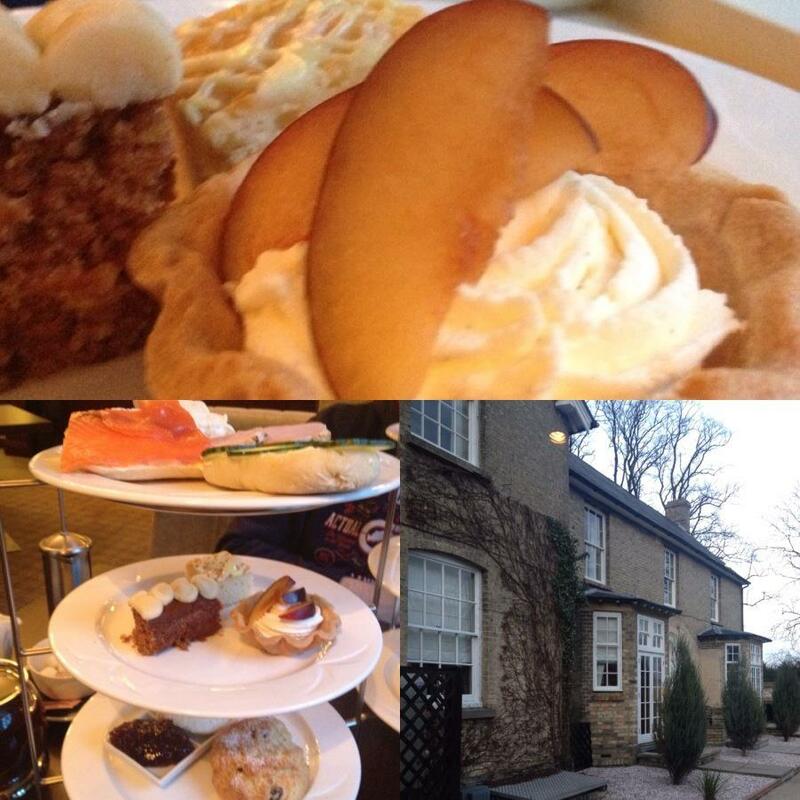 Scones allowed you to choose from cheese, cherry or fruit. No cherry scones were available on the day, so we both went for fruit, which came out warm with a very generous dish of strawberry jam and clotted cream, no measly portions here. The scones were delicious and no fuzzy tongues (none of that horrid secret ingredient found in so many, bleurgh!) 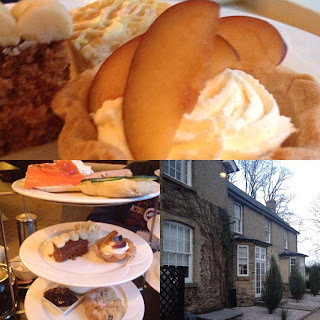 after enjoying them, one of my favorite scones in Cambridgeshire I have to say! There was also three cakes on the middle tier, a small carrot cake with pretty piped cream cheese frosting swirls, a very moist lemon drizzle cake and a fruit tartlet with fresh Nectarine and vanilla cream swirled into a buttery pastry case. These three treats were very happily gazumped by my dining partner, but I couldn’t manage them so I was allowed to take them home in a doggy bag for a second cuppa and sweet bite later on. The service was friendly, fast and non intrusive, they left us to enjoy our food and I couldn’t fault them at all, they were fantastic. 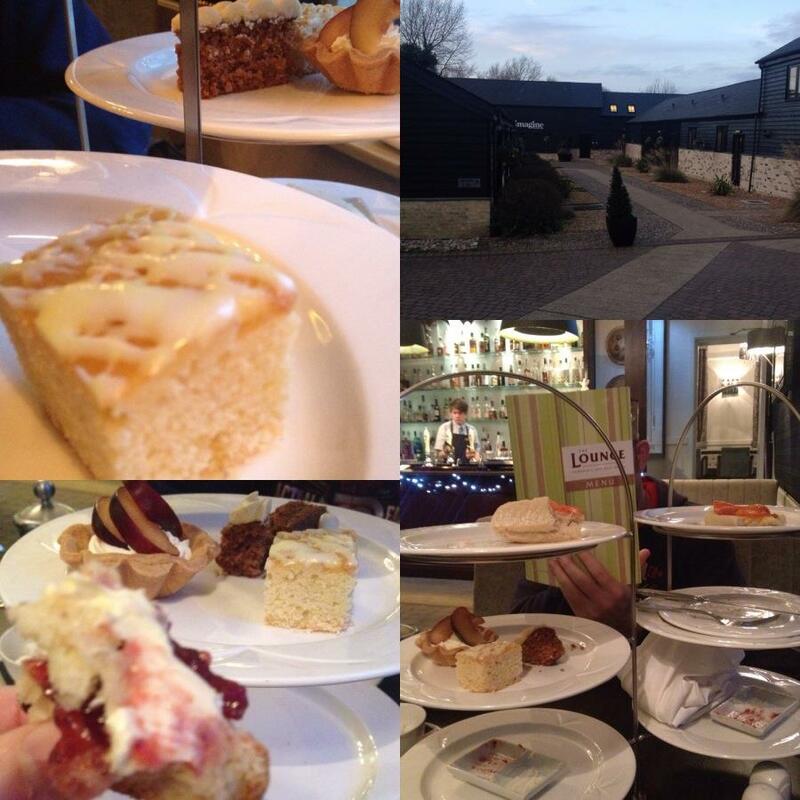 I highly recommend Afternoon Tea at Quy Mill, the next time I go back there, I may even book myself a pamper day to go with it! 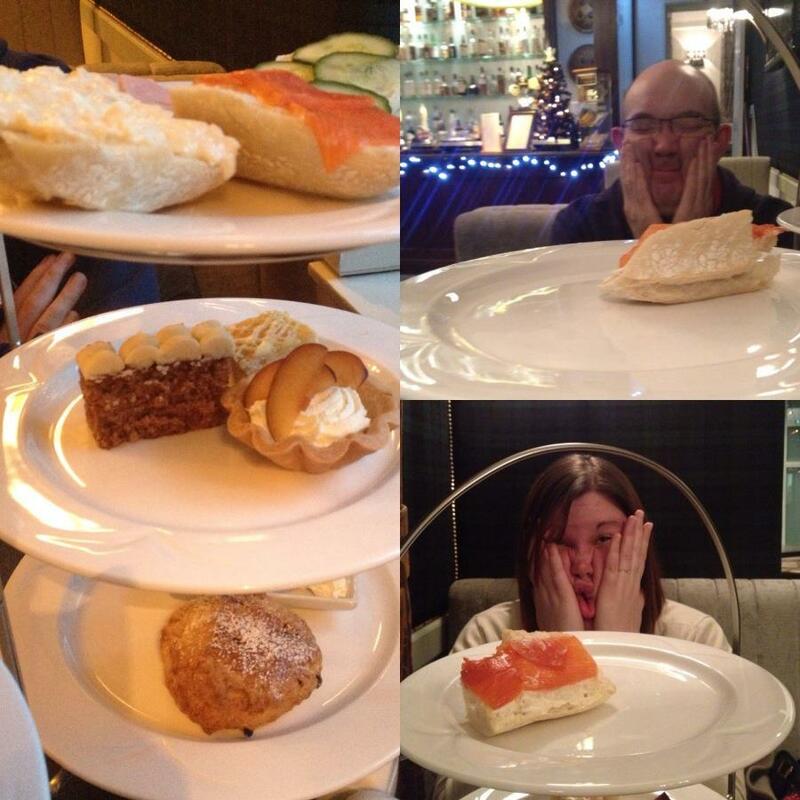 In fact, we were so relaxed in our own company, as everybody else there was dining in the adjacent conservatory, that we actually played on the sugar rush and took some photos of silly faces for giggles… we were in a silly mood to shame the Etiquette enthusiast in me (Sorry William!) hehe. from £14 per person or £20 with Champagne. 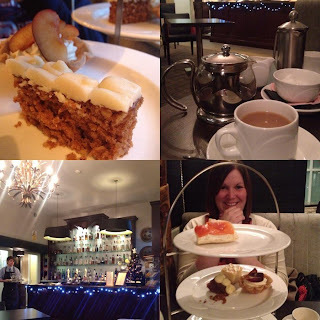 If you would like to discuss an independent review or blog write up on any of the subjects on my blog, please do email Miss Sue Flay: cake@secludedteaparty.com for a chat. We have had some very nice meals here too. I hope you enjoy there, and thanks for sharing your experience.